MGM organizes the seminar on GBA’s development and the opportunities for Macau, exploring China’s economic development plan with over 300 participants. With the support of the Economic Affairs Department of the Liaison Office of the Central People’s Government in the Macao Special Administrative Region, MGM has successfully hosted a series of seminars on national education since 2016. On September 26, MGM held another seminar of the series, titled “The Development of the Greater Bay Area and the Opportunities for Macau”. Dr. Guo Wanda, Executive Vice President of China Development Institute was invited as the keynote speaker to shed light on both opportunities and challenges of the Greater Bay Area (“GBA”) plan for Macau. More than 300 MGM team members and teaching staff of local tertiary educational institutions attended the Seminar. Over the past years, MGM has offered a wide variety of national education seminars, with topics ranging from the economic development of both Mainland China and Macau, Belt and Road Initiative, to Chinese traditions and culture. As part of MGM Talent Development Series, the “Seminar on the Development of the GBA and the Opportunities for Macau” enabled participants to better understand the significance of the GBA development plan, and its impact on Macau as a “World Center of Tourism and Leisure” and the “Commercial and Trade Cooperation Service Platform between China and Portuguese-speaking Countries”. Teaching staff of three local tertiary educational institutions were also invited to gain inspiration on how to cope with the strategic development of the GBA. The event was graced by the presence of Mr. Zhang Yifeng, Deputy Director of the Economic Affairs Department of the Liaison Office of the Central People’s Government in the Macao S.A.R. ; Mr. Anthony Leong, Deputy Director of the Gaming Inspection and Coordination Bureau; Mr. Grant Bowie, Chief Executive Officer and Executive Director of MGM China Holdings Limited; and Ms. Wendy Yu, Senior Vice President of Human Resources of MGM. The keynote speaker, Dr. Guo, is also the Vice Chairman of Chinese Association of Hong Kong & Macau Studies. He has chaired a number of study projects on national, provincial and municipal government policies. During the Seminar, Dr. Guo shared his insights into the opportunities and challenges brought by the GBA plan, as well as the policies announced by the Central Government in recent years, such as the elimination of work permit and the issue of residence permit for Hong Kong, Macau and Taiwan residents. 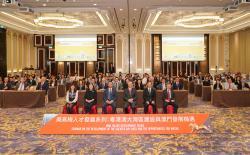 He also highlighted that Macau, as one of the key nodes in the plan, should utilize its competitive advantages under “One Country, Two Systems” to speed up its economic diversification and to increase its international influence on the development of finance, Chinese medicine, cultural and creative industries, as well as conventions and exhibitions sector. MGM is an abbreviation for MGM China Holdings Limited (HKEx: 2282) and is a leading developer, owner and operator of gaming and lodging resorts in the Greater China region. We are the holding company of MGM Grand Paradise, SA which holds one of the six gaming concessions/subconcessions to run casino games in Macau. MGM Grand Paradise, SA owns and operates MGM MACAU, the award-winning premium integrated resort located on the Macau Peninsula and MGM COTAI, a contemporary luxury integrated resort in Cotai, which opened in early 2018 and more than doubles our presence in Macau. MGM MACAU is a Forbes Five-Star luxury integrated resort inspired by the arts with every element of the resort infused with creativity and style. MGM MACAU has approximately 600 guest rooms and suites and boasts a number of distinguishing features, including the architecturally stunning European-inspired Grande Praça, housed under a soaring glass ceiling. MGM MACAU’s world class facilities include the MGM Art Space, dedicating over 5,000 square feet to display authentic works of art, conference and event facilities, spa, and seven signature restaurants and bars to fulfill any gastronomic craving. Our property is conveniently located on the Macau Peninsula and is directly connected to the luxury retail shopping complex, One Central. MGM COTAI is the latest addition to the MGM portfolio in China. Designed as the “jewelry box” of Cotai, it offers approximately 1,400 hotel rooms and suites, meeting space, high end spa, retail offerings and food and beverage outlets as well as the first international Mansion at MGM for the ultimate luxury experience. MGM COTAI also offers Asia’s first dynamic theater and a spectacle to wow every guest who steps foot in the resort. MGM COTAI is developed to drive greater product diversification and bring more advanced and innovative forms of entertainment to Macau as it grows as a global tourist destination. MGM COTAI is the largest property and the first mega-size complex project in Macau to achieve the China Green Building Design Label Three-Star Certification.